Durness is almost as far north as you can get on Scotland’s west coast. It’s also your final destination when you drive the Ultimate Scottish Coastal Route, a fascinating journey which starts in the uttermost south west of Scotland, in Dumfries and Galloway. This is and area where the nights can be very long in the winter and in the summer it’s hardly getting dark as Durness is on the same latitude as Stavanger in the south of Norway! 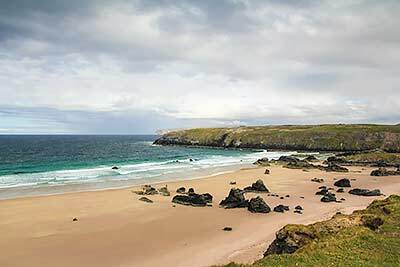 Durness itself is a small village with a population of around 400 folk whilst the area has been inhabited since stone age times. In this remote and lonely spot you will find all the services you could need, including a petrol station, shops, cash machine, accommodation and a pub. It also has an excellent Tourist Information Centre. The area is very interesting for a visit, especially with Cape Wrath rather close by. To reach Cape Wrath you will have to cross the Kyle of Durness which is the estuary of the rover Dionard. 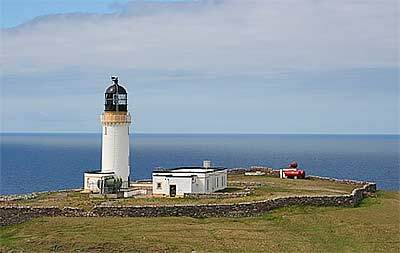 The easiest way to reach Cape Wrath is to take the Cape Wrath Ferry and to book the minibus service which will take you on the 11 mile trip to the lighthouse of Cape Wrath where you can admire the spectacular views along the north and west coast of Scotland. Visit this link for more info on the ferry and minibus service. Also nearby is Smoo Cave, a giant hole in the limestone cliffs which is very much worth visiting. But be warned, according to some this is a hiding place of the devil! If beaches are more your thing than you will probably enjoy Sango Bay which has a beautiful sandy beach. More beaches can be found further to the east along the A838 towards Tongue, the next bigger village on the north coast. Also hillwalkers and mountain climbers find this place a real haven as it offers towering cliffs, rugged mountains and expansive moorlands which all provide fantastic but sometimes challenging walking trails. For those arriving by motorhome, and there are many who make this journey, Sango Sands Oasis will be their port of call. This excellent campsite has plenty of space for motorhomes with commanding views towards the rugged north coast of Scotland. A view you don’t easily forget. 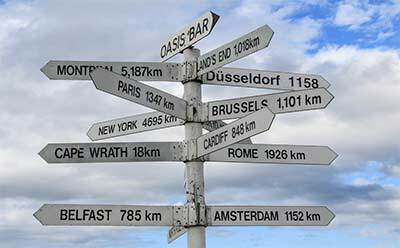 Although very remote, and especially in winter very lonely, visitors will find a petrol station, a few shops and a cash machine as well as accommodation and a pub. For those looking for information there’s a good Tourist Info Centre. Picture of cape wrath lighthouse by Anne Burgess licensed under the Creative Commons Attribution-Share Alike 2.0 Generic license.